The legendary Kareem Abdul-Jabbar (center) was roasted in a celebrity roast hosted by George Lopez on Saturday, November 17 at LA Live. The roast benefited the Skyhook Foundation and was attended by a who's who of celebrities including legendary basketball friends, Dr. J. Julius Irving, Magic Johnson, Bill Watson, Norm Nixon, Kurt Rambis. Jamaal Wilkes and AC Green. 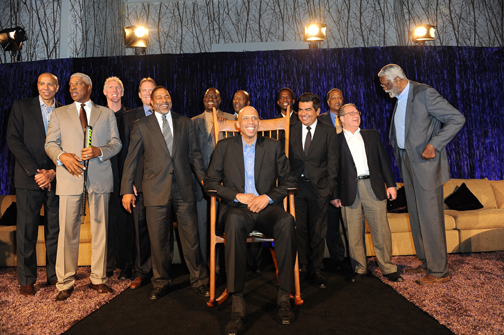 Here, Kareem ends the night with a group shot of some of those who spent time on stage roasting the icon for a sold-out crowd. For more information go to www.kareemabduljabbar.com.